Sha’aban is the eighth month of the Islamic calender, it is the month before Ramadan. Nisf Sha’aban or Mid-Sha’aban is the 15th day of the eighth month (sha’aban) of the Islamic lunar calendar. Laylat Nisf Sha’aban is the night preceding the 15th day of Sha’aban. The most important event at the fifteenth of Sha’aban was the changing of the qiblah which was ordered by God from Masjid Al-Aqsa (Al-Aqsa Mosque) in Jerusalem, to Masjid Al-Haram (The Sacred Mosque) in Mecca. In Syria, it is a tradition to celebrate Nisf Sha’aban every year. 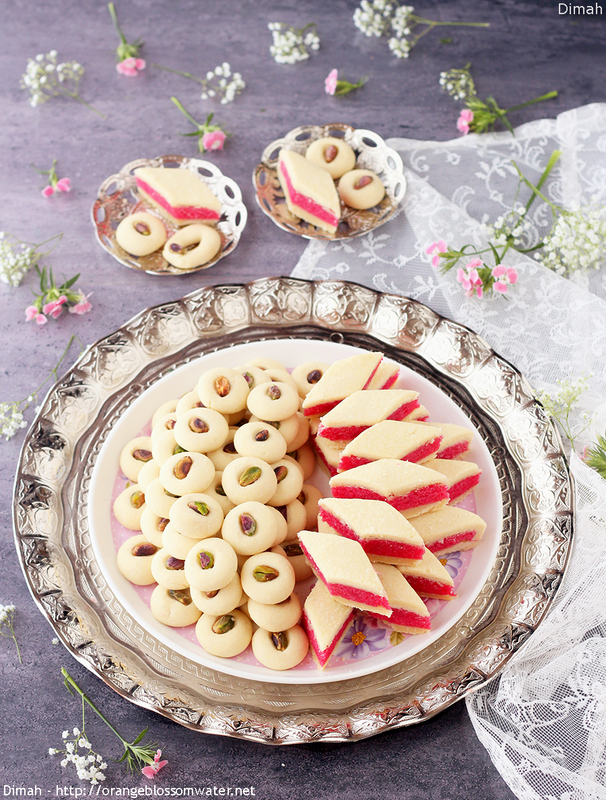 In Hama, special sweets are prepared for this occasion, these sweets can’t be found on other days of the year, they are Ma’amoul Abiad, Makbouseh, Mahia and Bashmina. In Aleppo, the food prepared for Nisf Sha’aban is different, the occasion is celebrated by making Ma’arouk Nisf Sha’aban and Sambousek Lahmeh (meat pies). 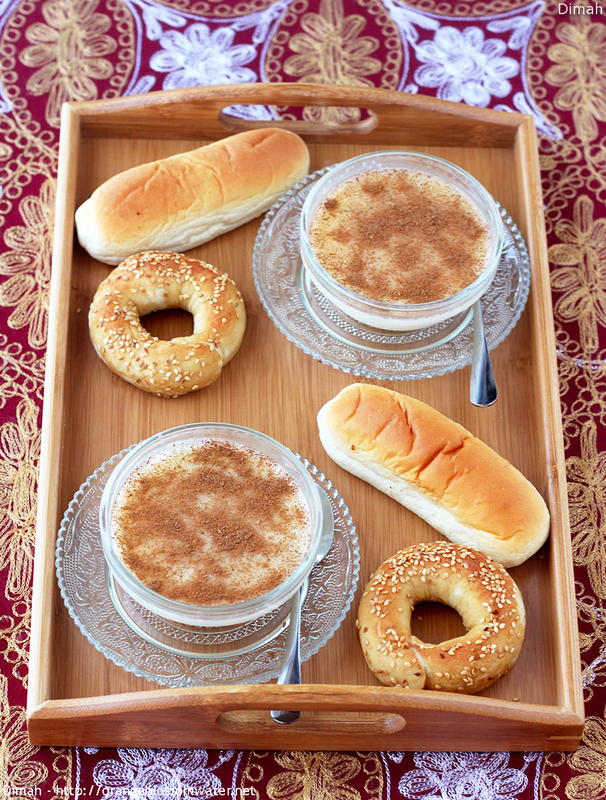 Heitaliyeh is a dessert that has two types which are Heitaliyeh Bel-Halib and Heitaliyeh Bed-Dibs. 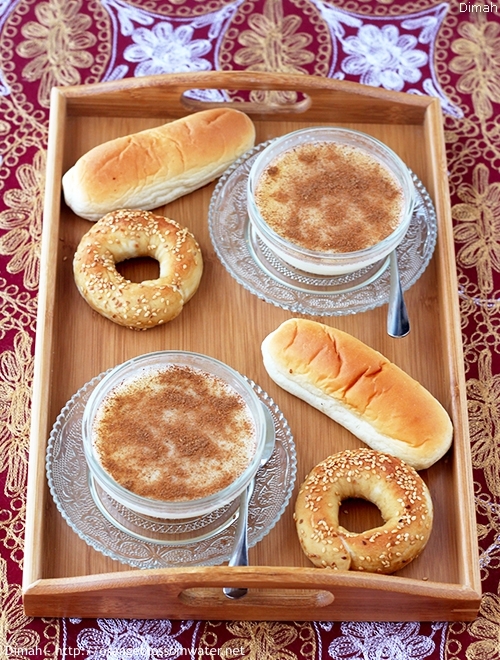 Heitaliyeh Bel-Halib is made of milk cooked with cornflour, poured into a tray, cut into bite-size cubes then served with sugar syrup or Bouza ‘Ala Halib “Milk Ice Cream”. Heitaliyeh Bed-Dibs is made of cooked cornflour, poured into a tray then served with grape molasses. Heitaliyeh Bed-Dibs is older than Heitaliyeh Bel-Halib. According to “Encyclopedia of Aleppo“: “Heitaliyeh is named after “Hittal” Turkish tribes inhabit Bukhara, Samarkand and Khujand. The merchants of Aleppo tοοk the name from these tripes, and these tripes took it from China. 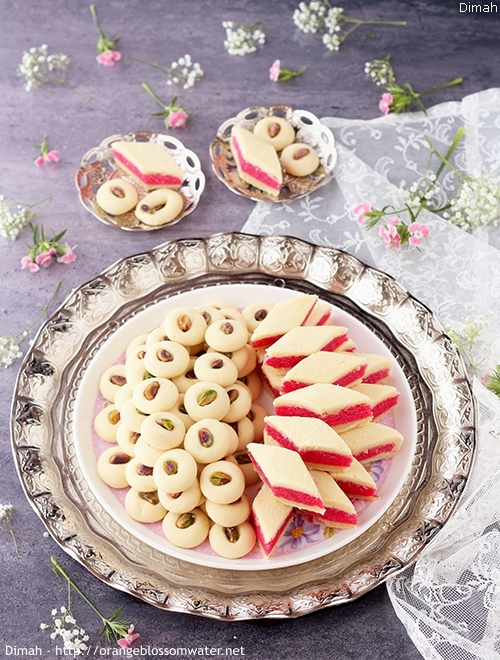 This is supported by the fact that the dessert is still present in Turkestan and India, and Aleppo is serving it in Chinese ceramic bowls and Chinese spoons. The other cities in Syria took this dessert from Aleppo. In Damascus, it is called “Heilatiyeh”. 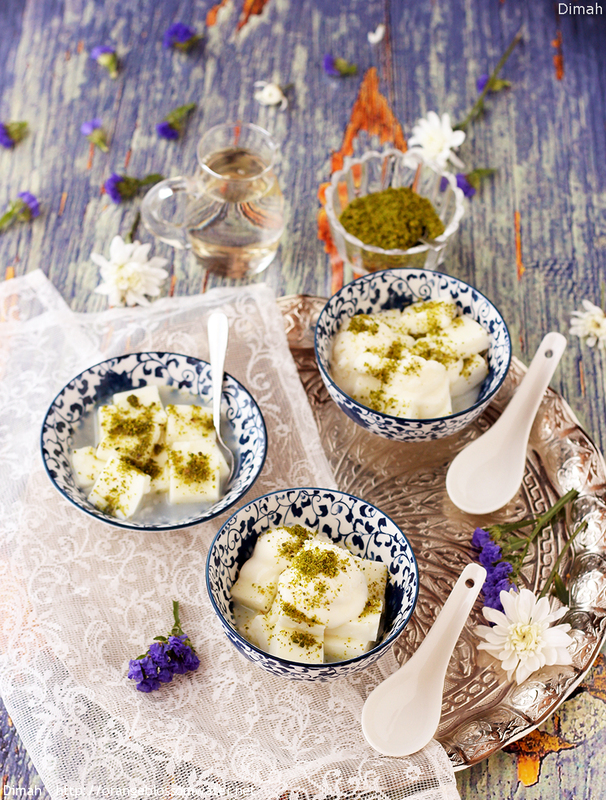 Bouza ‘Ala Halib is a delicious Syrian Ice Cream made of whole milk, Sahlab (Salep) and mastic. 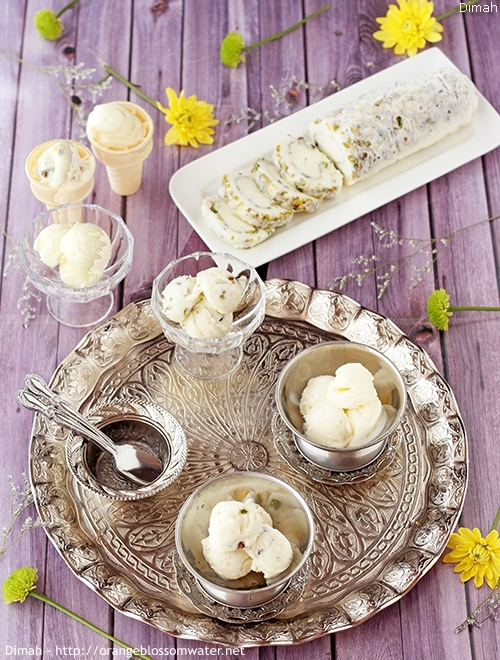 In Damascus, milk ice cream is named “Emaa'”. It is also called “Bouza ‘Arabiyeh”. Syrian ice cream whether milk ice cream, chocolate ice cream, or fruit ice cream is perfectly thick and stretchy, thank to the special ingredient “Salep” which is a white flour like powder made from the tubers of the orchid genus Orchis (including species Orchis mascula and Orchis militaris. In ice cream parlors in Syria, the ice cream is manually churned, it’s pounded with large wooden mallets and then pulled and stretched. Today my blog celebrates its tenth birthday. It’s been ten years. I started this blog on February 28, 2009. I can’t believe it. Thank you for showing up here, for taking interest in things I care about. I hope this space is always a place where you feel welcome and inspired. I’m looking forward to the coming years!